Thanks to last month’s sad passing of this biopic’s subject matter, eeriness now surrounds the long-awaited dramatization of the life of Nelson Mandela. It is as though audiences are watching a “greatest hits” album shoddily put together to monstrously cash in on the event, a notion that is surely far from director Justin Chadwick’s original intentions. But Mandela: Long Walk To Freedom is anything but shoddy, though it does have its own share of faults that keep it from becoming one of the better biopics out there. One such flaw is one it shares with another biopic of a famous political leader, The Iron Lady. It tries its hardest to cram in as much as possible about the person they’re representing, but that only results in either important elements being rushed and soon forgotten about, or too much focus on one thing when it should really be covering another. Like the Margaret Thatcher film, Mandela: Long Walk To Freedom keeps its primary focus on the real-life figure but doesn’t seem to care about much else around them. For instance, the relationship between Mandela (Idris Elba) and his first wife is barely looked into and leaves you wondering why they bothered to include it in the first place, especially when much more of the film seems to be interested in his relationship with second wife Winnie (Naomie Harris). Many of the scenes between these two are exceptionally crafted and add great weight to the drama, whereas The Iron Lady seemed more cluttered and messy when attempting to dive into emotional scenes between characters. However, this film desperately wants to tell the Mandela story with lesser emphasis on Winnie’s own struggles against the borderline-fascist South African government, therefore the film loses focus many numbers of times. 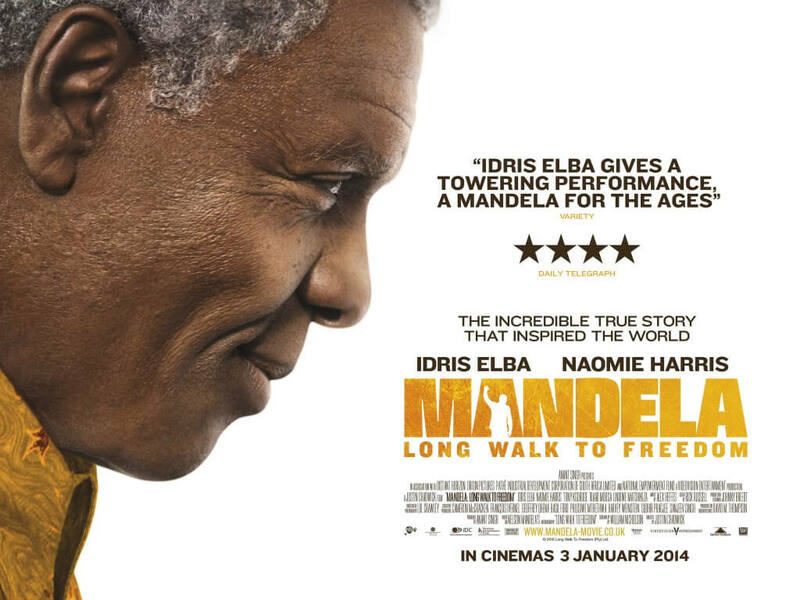 But that isn’t to say that Mandela: Long Walk To Freedom fails completely as a feature film as opposed to a television drama. Chadwick may fall into the common trap of inserting uncomfortable amounts of cheesy, manipulative melodrama every once in a while – the court scenes wherein Mandela and fellow conspirers are sentenced give in to inspiring clichés like delivering impassionate speeches to the counsel and spectators cheering for the accused et al – but he makes up for it with a great sense of atmosphere. Something as simple as Mandela and Winnie walking through an African field while the soundtrack focuses on the rustling of the weeds in the wind adds a lovely feel to the scene in general, aided by cinematographer Lol Crawley’s fine work. And, of course, the performances themselves are great and capture the spirits of their real-life counterparts. Elba is a magnificent Mandela, always calm and collected but never afraid to declare his feelings to his worst enemies, and establishing a dominant presence that a heavy role such as Nelson Mandela badly needs. Harris is also wonderful in the surprisingly many scenes she gets to explore her range with, creating a freedom fighter harassed by the Apartheid government who refuses to back down from what she believes in. In all honesty, the movie would have probably crashed and burned had lesser actors be cast in these very meaty roles, but Elba and Harris pull it off wonderfully and keep you invested even when the film itself doesn’t focus on anything other than Mandela. There is definitely a lot to like about Mandela: Long Walk To Freedom, but sadly there is also a number of elements that keep it from being truly great. As it is, it’s passable enough and does the job to a satisfactory level, if not entirely standing out like it probably could have been.